Heidi gives a victory speech to the New York vampire clan. 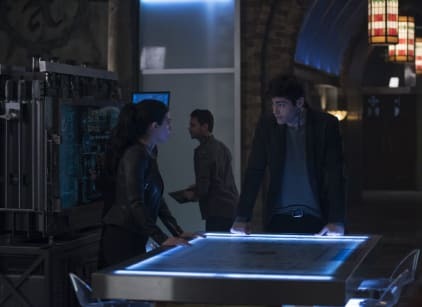 Magnus is staying with Alec at the Institue, but he's afraid the Shadowhunters won't be too welcoming of a downworlder. Maia tells Simon she wants to be there when Heidi is brought into the Institute. Heidi comes to Alec and Isabelle and pleads for a clean slate, but Isabelle isn't buying her apology. Alec accepts it in return for the names of the vampires who killed the wolf pack. Luke is being held at the NYPD for being at the scene of a murder. Clary and Jace try to get him out, but he blames himself for his pack's death and is determined to take the fall. Isabelle goes to arrest Raphael after Alec discovers she let him get away with holding Heidi captive. Clary spars with Aline but in her rage takes things too far and beats her up. Jace convinces Aline not to have Clary arrested. Alec arrests the vampires, but Simon and Maia want Heidi arrested as well. They go to Nora to get proof but Heidi gets to her first. The rune draws Clary and Jonathan together. Clary goes back to the Institue and Jace catches her with her hand in the fire. He tells her they need to see the Silent Brothers. Maia injects herself with holy water and tricks Heidi into biting her, which kills her. Raphael willingly goes with Isabelle back to the Institute, and they admit that they'll always care for each other. Simon tells Maia killing Heidi was wrong and that if they don't follow the rules they're no better than her. Alec and Magnus decide to move in together since Magnus can't technically stay at the Institute. Magnus' nose starts bleeding and he collapses.